First, most offensive to Egyptians—and helpful to the Brotherhood’s cause—is McCain’s insistence on calling the June 30 Revolution a “military coup.” In reality, the revolution consisted of perhaps thirty million Egyptians taking to the streets to oust the Brotherhood. McCain is either deliberately misconstruing the event, or believes the story as manufactured by Al Jazeera and promulgated by Ambassador Anne Patterson. In this narrative, at least an equal amount of Egyptians supported Morsi, and the military overthrew him against popular will. Al Jazeera has actually broadcast images of the millions of anti-Morsi protesters and identified them as pro-Morsi protesters, disinformation which was quickly adopted by Western media. McCain’s designation raises other questions as well. If he considers the ouster of the Brotherhood government to be a military coup, why didn’t he extend that distinction at the fall of Mubarak’s more moderate government, which was also removed by the military in response to popular protests? If McCain’s argument is that Morsi was democratically elected and Mubarak was not, then why was the U.S. giving Egypt billions in aid for decades—thus legitimizing Mubarak’s government no less than Morsi’s? 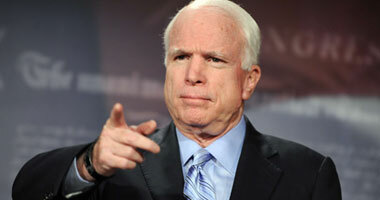 Further angering Egyptians is McCain’s insistence that all arrested Brotherhood members be released from prison. As Musa said, McCain’s stance does not address the fact that Brotherhood leadership is awaiting trial on serious charges: inciting terrorism, causing the murder of Egyptians, and grand treason by conspiring with foreign powers against Egypt’s interests. McCain claims he is simply interested in the human rights of the incarcerated Brotherhood members, a statement that is additionally curious. If human rights are at issue, why has McCain and the U.S. administration been indifferent to the fate of Hosni Mubarak? Morsi faces perhaps more serious charges than Mubarak does, yet McCain calls for his release. I think they are a radical group that first of all supports Sharia law; that in itself is anti-democratic—at least as far as women are concerned. They have been involved with other terrorist organizations and I believe that they should be specifically excluded from any transition government. Egyptian media has also pointed out that McCain repeatedly dodged critical questions by Egyptian journalists at the press conference. When asked about the fact that the Brotherhood in Rab‘a was armed to the teeth, and—with the aid of al-Qaeda—was killing and terrorizing innocent Egyptians, McCain ignored the question. This, of course is in keeping with the fact that McCain has also ignored the question as to why he is the staunchest supporter of the jihad in Syria, which has torn that nation apart, seen the slaughter and displacement of untold thousands of Christians and the destruction of their churches, and the beheadings and “legitimized rapes” by foreign jihadis whom McCain is in favor of arming. Many Egyptians are also wondering why McCain—as well as the Obama administration—is pushing for elections as soon as possible. Such a rush contributed to the empowerment of the Brotherhood in the first place: once the long-entrenched Mubarak was removed from power, the only party that was organized and ready to campaign was the Brotherhood. Secular Egyptian parties wanted to postpone the 2012 elections in order to mobilize their campaigns, but the U.S. was adamant that Egypt hold elections immediately. When the military wished to perform a recount, citing irregularities in the election—including widespread allegations of voter fraud by the Brotherhood—Hillary Clinton chastised them and called for a winner to be declared as soon as possible. This turned out to be Morsi, by a tiny margin—if that. In short, McCain’s remarks and actions in Egypt have further confirmed the popular narrative—as memorably displayed by countless anti-Brotherhood and anti-Obama placards raised during the June 30 Revolution—that U.S. leadership is aligned with the Brotherhood, and thus ultimately a supporter of terrorism. Americans can no longer afford to ignore this serious accusation with broad implications. Filed Under: From The Arab World, Islam Tagged With: al-Qaeda, Arab Spring, connect the dots, jihad, Morsi, Muslim Brotherhood, Muslim persecution of Christians, Obama, U.S.